Much has been made about President Obama's name and heritage. The blogosphere is filled with stories how Barack Obama was called Barry Soetoro by his step-father, when he lived with his parents in Indonesia. Apparently, this disqualifies Obama from ever being president, or a lawyer. Speaking of lawyers, the Birthers' ringleader is a mediocre dentist with a diploma mill law degree, who now lives in Mission Viejo, California - by way of the Soviet Union and Israel. Are you following me so far? Good. It seems that Gerald Ford, our 38th president, was known legally as Leslie Lynch King, Jr., as a child. Clearly a subversive impostor. I don't know how we ever made it through that usurper's presidency. Was his appointment of Justice Stevens even legal? Must have been the communists. I guess they didn't want to be blamed for any turmoil here, so they arranged everything with their liberal sympathetic contacts in the media. William Jefferson "Bill" Clinton was born William Jefferson Blythe III. Uh, oh. Wait - the plot thickens. Remember Mitt Romney, erstwhile governor of Massachusetts? It seems he is concealing his actual name. I wonder what he is hiding? Oh, yeah. His actual first name is Willard. Really. 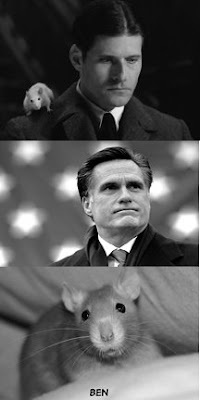 As in Willard the pet rat collector. Politicians should never be named Willard, just like pets should never be named Ben. It's unseemly. So now you know why he insists his name is Mitt. Just like he insists he hates polygamy, unlike his ancestors, and unlike the Mormon I once worked for, who had two wives. My favorite Willard: Fred Willard. Also, there's Willard Scott, but I've never been a fan of his work -- although I am a fan of weather in general.